Toshiba have released their first netbook, namely the Toshiba Mini NB205. The Toshiba netbook meets Energy Star 5.0 standards and was awarded the Electronic Product Environmental Assessment Tool (EPEAT) Gold status too. The netbook has a 1.66-GHz Intel Atom N280 processor, which contributes to its low energy status. The 10.1 inch screen supports a native resolution of 1024×600 and features 8.5 hours of battery life from a 63Wh 6-cell battery. The laptop ships with MS Windows XP Home, but of course you can easily get Linux running on it if you wish. All the usual bells and whistles, such as 1GB of RAM, 160GB Disk, 802.11b/g Wireless, and a 3-1 card reader. 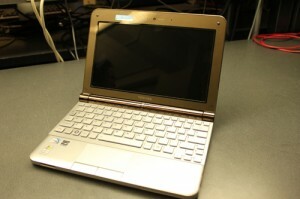 The mini netbook measures 10.4 x 7.6 x 1.3 inches and weighs 2.8 pounds (1.3kg). The current price is around $349.99 in the US.